In the past, we’ve discussed Twitter Bootstrap quite a bit. 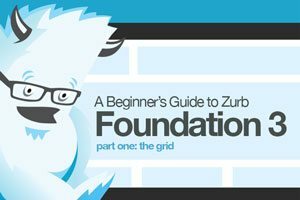 Much more so than its most worthy competitor: Zurb’s Foundation. Now on its third iteration, Foundation is a robust and responsive front end framework used by hundreds of developers every day. Over the course of several articles, we’re going to jump in and take a look at its various aspects from a complete beginner’s perspective. Today’s topic is my favorite part: the grid. Follow along to see how it works! If you’re a regular reader of Design Shack, then you probably already know that I’m a bit of a grid nut. Layout is the aspect of CSS that fascinates me the most and I simply love digging around and playing with different grid systems that people create. No, they’re not always perfectly semantic (though some are), but they can be an incredibly helpful way to bust out really complex layouts with very little effort. The grid that comes built into Foundation is no exception to this rule. It’s remarkably easy to use, has all the features that you could want and adapts quite well to different viewports. Let’s take a look. Like countless other grids, the foundation Grid is built on a twelve column system. By default, the grid’s width is 940px wide when it is at its full width. However, the grid is fluid, so as your viewport becomes narrower than 940px, the grid will adapt. The Foundation grid’s fluid nature helps it adapt as the viewport narrows, but once you hit around 767px, a media query kicks in and simplifies your complex layout into a single column. Obviously, such a simple solution might not always be desirable, so there are ways to intentionally reflow your layout into a four column mobile grid. We’ll see how to do this later. If you’re at all used to grid systems, Foundation should be really easy to pick up. If you’re completely new to grids, don’t worry, I’ll walk you through it and you’ll catch on in no time. Basically, Foundation has done most of the heavy CSS layout work for you. The center 940px of the page is split up into twelve columns and various possible column combinations are assigned to classes. This means that, to perform a basic layout, you don’t need to write a single character of CSS. All you have to do is use the right classes in your HTML. The very first thing that you need to do when adding content to the page is create a row. This is exactly what it sounds like, a chunk of content that will be displayed on the same horizontal plane. All the floating, padding, margins and various layout complexities have been taken care of so you can focus on your content. To begin a row, simply create a div with a class of “row”. How easy was that? Now let’s see how to add in some columns. To add columns of content, you create a new div and assign two classes. The first class is a number that corresponds to the number of columns that you would like this content to span. So if you want your content to take up three of the available twelve columns, you assign “three” as a class. Here I have a nice little container will automatically set boundaries on the content within so that it takes up no more than eight columns. Now, typically (though not always), you’ll want to eat up the entire twelve columns in a given row. We’ve already used up eight columns in our first div, so if we want one more, we’ll write “four columns” in the class area (8 + 4 = 12). As you can see, we’ve effectively created two chunks of text with a width ratio of 2:1. This makes perfect sense because we used the classes eight and four, which also have a 2:1 ratio. When this really clicks in your brain, it becomes a powerful concept because you can suddenly pull off almost any layout you want using only a few simple class names. Note that you don’t have to fill all twelve columns. Use the “end” class if you want a div to be the last in a row that doesn’t span twelve columns. Using the principles that we just learned, we can achieve all kinds of different layouts. Let’s say that we wanted a row split up into four equal sections. All we have to do is use the “three” class. By now, you should have the hang of how this works. If you have the mathematical ability to divide things into twelve, then you can use this framework. So we can see how this works on a larger scale, let’s jump into a full on complex page layout. Don’t let this big chunk of code intimidate you, it utilizes the exact same principles that we’ve been using in the smaller examples. As you can see, we used a lot of different column variations here. We’ve got divs that span all twelve columns, including one with an image, and others that only span three. It all comes together into a beautiful and simple layout. Check out the demo below to see it live. Now that we understand the basic functions of the grid, let’s take a look at some of the more advanced features. Nesting is an essential feature of any grid system. It allows you to start a whole new twelve column grid within the main grid. So let’s say you have an eight column span and a four column span, you can divide that eight column span into twelve columns of its own. Crazy right? If you go too far, your brain will fall into limbo but on a basic level, nesting is super easy to accomplish. Foundation comes with three interesting ways to mess with how the layout of your grid works. For starters, it’ll often be the case that you want to center a column or span of columns. All you have to do for this is add the “centered” class. This will create a div that spans six columns and center it on the page. If we tossed a horizontal rule in here, we’d have a nice little six column centered dividing line. In addition to centering divs, you can also offset and rearrange them. To offset a div, use “offset-by”. So “offset-by-one” will offset it by one slot and “offset-by-two”, well, you get the point. Here you can see that the class numbers only add up to ten, which leaves two spots left. I account for this with a two column offset. Here’s the result. To rearrange divs differently in the output than they appear in the source order, you use push and pull classes, similar to in the old 960 grid system. Now check out the result. Even though the “three” column comes before the “nine” column in the source, the live preview shows the reverse of this. The logic behind this is usually SEO related. Say you wanted your company name as a header in the middle of the page between two other columns, it may be better for SEO if the company name is higher in the source hierarchy. As you can see, when I get to the four “three columns” divs, I added the “mobile-two” class to each. This will not affect these divs at anything above 767px wide. However, below that width, each of these divs will take up half the available width. The mobile grid is an awesome feature that allows you have a ton more control over how your layouts adapt to smaller viewports. In the end, it’s probably a good idea to consider writing a media query or two of your own, but this definitely still helps. Check out the demo below to see it live (be sure to reduce the window size). With this information, you should be able to get off to an awesome start with the Foundation grid. Responsive layout is no walk in the park and this framework goes a long way towards relieving this stress and allowing you to focus on your content. Keep on the lookout for more Foundation articles soon. Foundation is much more than a grid, there’s still a ton of stuff that we didn’t cover!